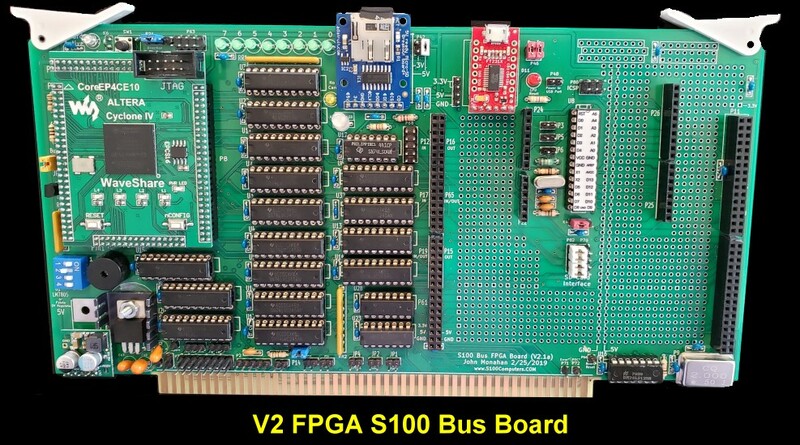 The S-100 Bus FPGA V2 Board. The original S100 bus FPGA board has proven to be a very useful development board. The board can be morphed into many functions. If you are not familiar with that board it is essential you read up on that board before going any further here. Much of what is written here assumes you are familiar with the "V1" board. There also is an introduction to FPGAs and how to program and use them. This "V2" board is an extension of the original board. All the board chips are the same and in general much of the software is the same so a switch and replace should be easy. That said, this V2 FPGA board has a number of useful enhancements. 1. A set of four 8X2 pin "shield sockets" has been added to the board so that various separate FPGA shield mini-boards can be separately fabricated and used with the same board. This is modeled on the Arduino Shields board concept. Such simple 2 layer boards can be simply fabricated by any PCB manufacture. 2. 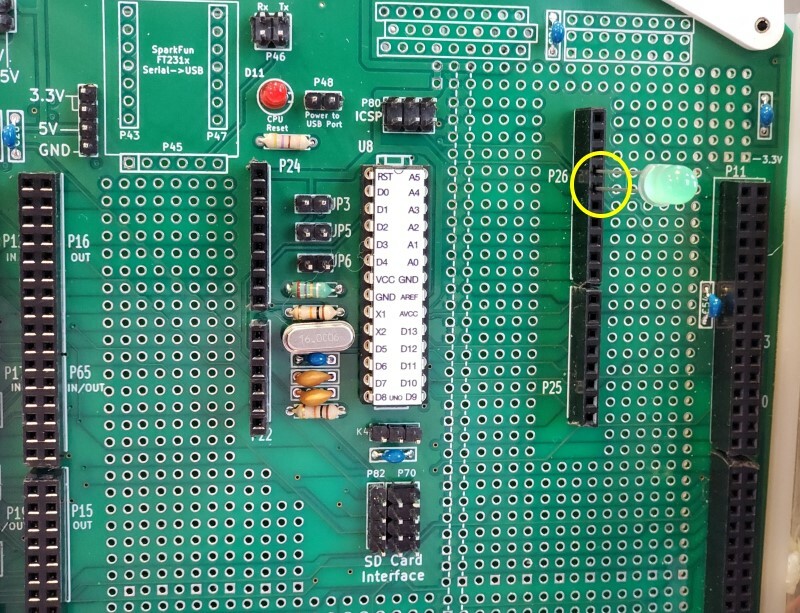 There is a prototype area on the board (as the was on the original board), but now a Arduino Uno circuit is also added with its corresponding Arduino Shields sockets. This would allow one to interface the FPGA with an ATMEGA 328 CPU or run it separately. 3. Every usable I/O pin from the Cyclone IV FPGA is brought out to the "FPGA Shields Sockets". Most are drive through 3.3V to 5V level converters. Some 8 are connected directly to the FPGA I/O pins and thus run at 3.3V levels. 4. 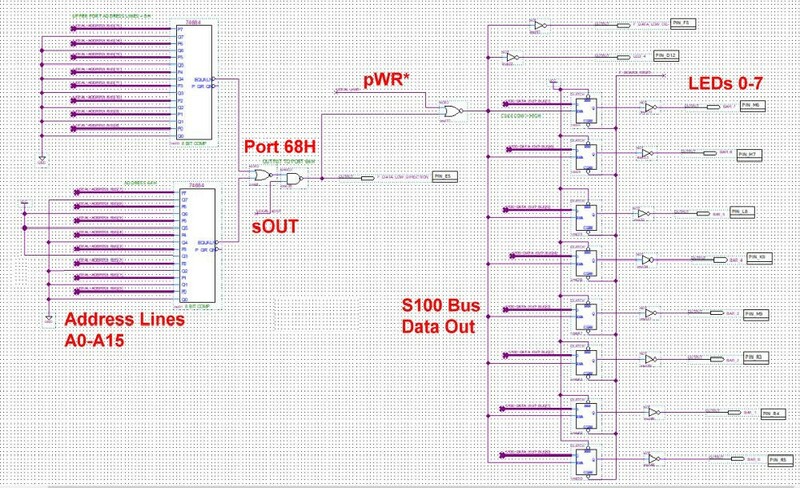 Every major S100 bus line is interfaced to the FPGA I/O pins such that the S100 bus can be run as a bus master or bus slave. 5. A number of minor errors/improvements have been corrected. The principal change being the removal of the two 74LS245 data bus drivers (U8 & U9) on the V1 Board. These were not needed -- even for a 21 slot motherboard. The 74LVC245s appear to have adequate drive and fan-out capability. Also the S100 Reset signal (pin 75) can be brought directly into the FPGA. As for the V1 board, broadly speaking our first FPGA board will be loosely modeled on our Edison II board. With programming, this FPGA board can (in theory), be configured to behave as almost any S100 bus board. Either as 1970's legacy boards or our own recent S100Computers boards. The board has four 2X8 0.1" connector sockets to attach your custom FPGA shield boards. There is actual a small patch area on the board itself as well. 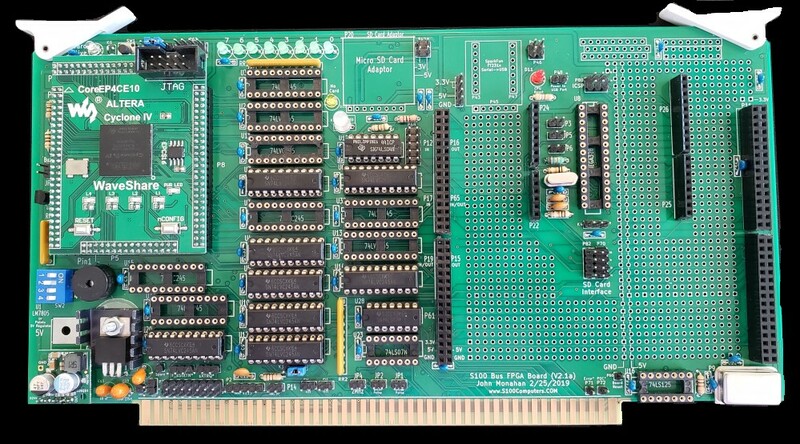 As for the V1 board the shield boards may be used for any application you might come up with. At any time one has absolute control and access to any S100 bus line. 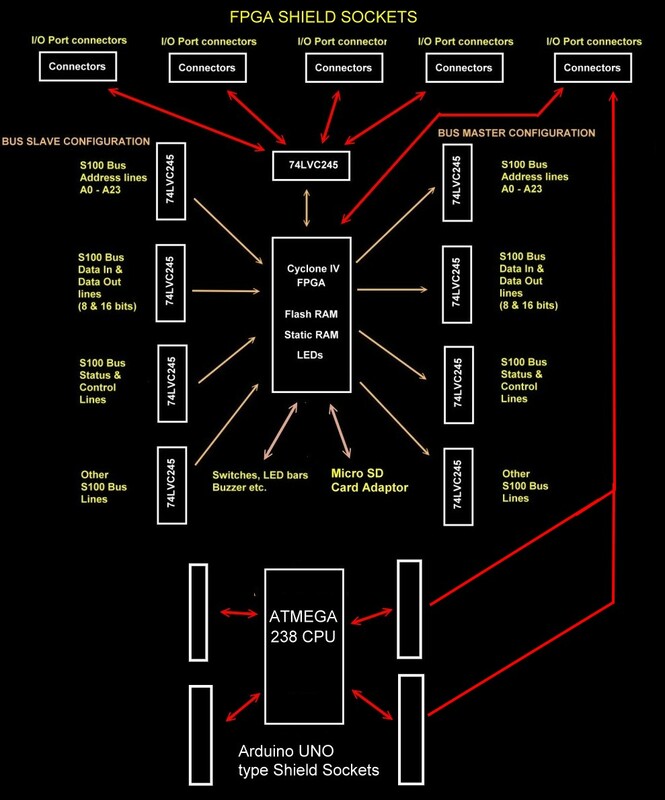 In a bus master configuration it could be in fact be the only CPU in the S100 bus. As for the V1 board this is a 4 layer board. 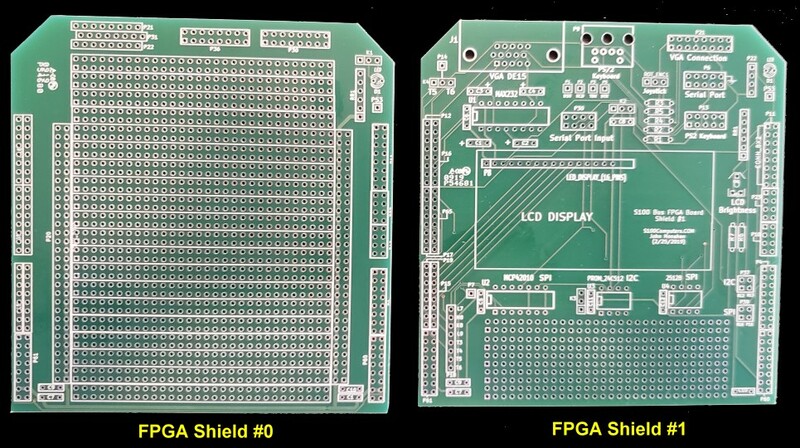 Here is the pinout for the FPGA Shields board. Please make a printout of it and always refer to it during construction. 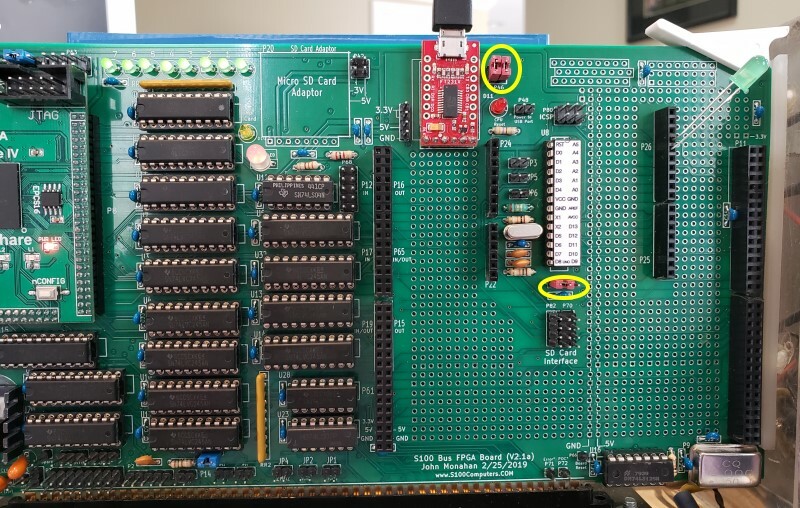 Please note that while most of the pins are 'buffered" via the 74VSL245 level shifters (and run at 5 Volts), 16 (P11), however have direct connections to the FPGA I/O pins. These pins must never see a voltage greater than 3.3V. Please use extreme care with this. You can blow out an FPGA I/O pin or the whole FPGA itself with voltages greater than 3.3 Volts. They all reside on the P11 connector. They are there primarily for bidirectional interface I/O pins. Here is an example of a "Shields #0" prototype board and a "Shields #1" board we will use (see below). Solder in all the required IC sockets, resistors, resistor arrays, capacitors, jumpers, and the Pololu 5V and 3.3V (LM3940) voltage regulators. Do not add the LED's yet. Also do not add the MicroSD Card Adaptor. Be sure you put the resistor arrays in with the correct orientation of pin 1. Check their values before soldering (they are difficult to remove). Insert all jumper arrays. Note there are two sockets for the Pololu 5V regulator. While the older ones (D24V25F5) are still available, it seems Pololu is suggesting users use the D24V22F5's (5V, 2.5 Amp) units. The 3.3V LM3904 3.3V regulator requires the removal of two or three of the fins on the LHS to fit under the Pololu 5V regulator. Here is a close-up picture. Use a Jameco #70658 heat sink. This regulator does not get even warm, but I always like to use heat sinks. Take care the side of the heat sink does not touch the two caps on its RHS. I like to use a mica washer under this sink. Please take care to not "slobber" solder on the sockets. They are very closely spaced on this board with vias often close to a socket pin - particularly for the FPGA adaptor sockets. For prototype boards I generally use "double swipe" IC sockets. For a critical board like this I prefer to use "Machine Tooled" IC sockets. However they are more expensive and you have to be particularly careful not to bend the IC pins. The 2MHz clock oscillator can have its own special sockets (e.g. Jameco #133006) but actually I find the "Machine Tooled" IC sockets make a better connection. I in fact solder the 2MHz oscillator (P7) directly to the board since it will never be changed. Solder in the buzzer SP1 with the "+" pin on the RHS. You may wish to play around with the buzzer sound volume by replacing the 100 Ohm resistor R11 with a lower one say 75 Ohms or 33 Ohms to get a louder buzzer sound later. So solder it high on the board for easy removal. Do NOT insert a 3 pin jumper in position K6 (it interferes with the WaveShare board). Instead jumper K6 pins 2 & 3 with a short wire. Place the board in the bus without any chips inserted. There are two separate voltage rails on this board 5V and 3.3V. Carefully examine the schematic and check the voltage to the individual sockets are either 5V or 3.3V. Your system should boot and run correctly with its Z80 master CPU board. If not, you have a serious solder bridge somewhere on the board. Before you do anything else with a magnifying glass go over every socket on the board and examine for proper solder joints. I like to "reheat" each joint just to be on the safe side. The silk screen/varnish on these boards is quite thick. It's easy not to have a good solder joint for the ground pins. Double check. Extra time here will save you hours later, (Been there, done that! ). Add the 12 LED's. The longer of the two leads for most LED usually goes into the square pad on the board. Before soldering them in place, and without the FPGA Adaptor, place the board in the S100 bus and ground the appropriate pins on the FPGA socket P6 to be sure they light up. Be careful to stick a very narrow wire into pins P6, 18-32. 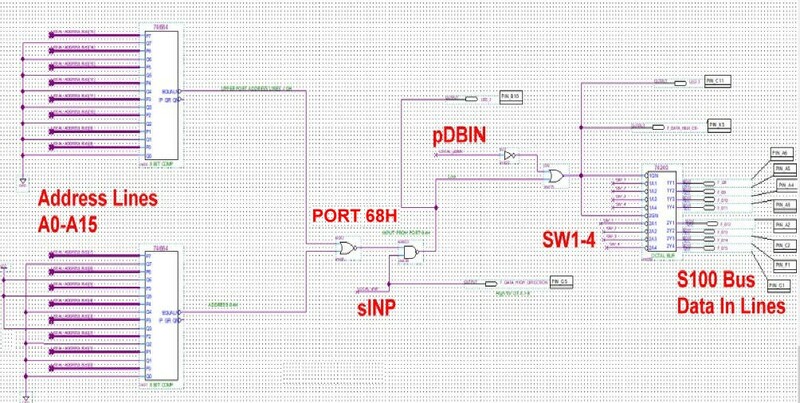 Also pin 18 of P7 (BOARD_ACTIVE). Don't damage the socket pins. The Dual Color LED K2 will need its pins slightly bent to fit. Next (carefully with a probe) jumper pin 10 of the U12 socket to +5V and orientate the dual color (3 pin) LED in K2 so it shines Red (not Green). Also ground pin 8 of P20 so the LED D10 lights up. There is one major construction decision you need to make with this board right at the start. The WaveShare unit uses unusual 2 mm dual row pin connectors. Unlike to normal 0.1" connectors these are quite rare and expensive (Digi-Key #S5750-30-ND) . If you solder these female sockets to the board the WaveShare adaptor sits quite high on the board and will prevent the next S100 bus slot from being used. If you carefully remove the JTAG socket top border edge with a wire cutter - all around about 1/8 " It will fit into most S100 bus motherboards without taking up two slots. Alternatively you can solder the adaptor directly to the S100 board. Of course removing the adaptor is all but impossible in this case. The actual pins for the adaptor are unusual. You will need to cut the above DigiKey 60 pin socket with a wire cutter to the required lengths. Cut the pin past the required length and file the cut end plastic to clean things up. Don't rush this process. Its critical it sits correctly on the board. First solder in each socket at two points. Insert the FPGA adaptor, then solder all the socket pins. 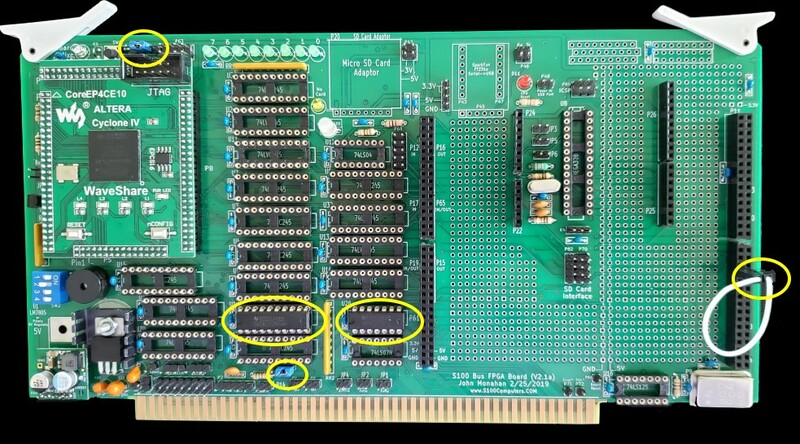 Likewise if you are using a specialized "Shields Board" you might consider soldering the connector pins on that board to the corresponding holes on this main board. However in almost all cases we will use 8X2 connector sockets on the main FPGA board. BTW, the KiCAD footprint for the FPGA adaptor board took me three prototype boards to get it exactly right. If you ever want to do your own board I suggest you start from this board. The large number of close pins allow absolutely no margin in the fitting. 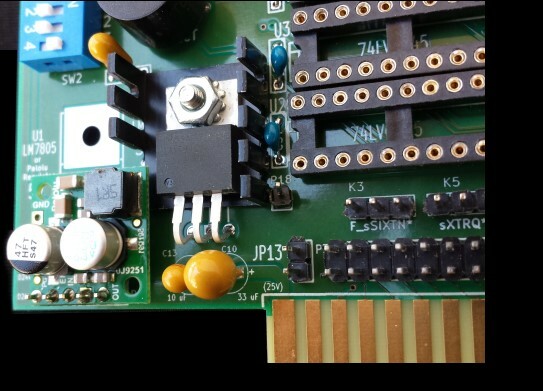 We will first program the WaveShare/Cyclone IV FPGA just to flash the 4 LEDs on the Waveshare FPGA adaptor board. For this all we need is the two above voltage regulators and the WaveShare adaptor attached to the S100 board. First is the very simple Demo_01.bdf program. It simply flashes the 4 LEDs on the WaveShare adaptor board. There is no interaction of the other FPGA pins with the S100 bus circuits. Note the file Demo_01.sof resides in the output_files directory. Also be sure your device is a EP4CE10F17. If you have watched this video, the above .bdf program is obvious and trivial. Note some "virgin" Cyclone IV Adaptor boards from WaveShare seem to have the FPGA preloaded with a program (in the EPCS16 Flash RAM) that already pulses the 4 onboard LEDs. You must get the above Demo_01.bdf program to work before going further. Here is a picture of the board at this time. The D9 LED (BOARD_ACTIVE*) should not light up (until you have an FPGA program running). Next add U10 and U28. Jumper the LHS FPGA Shields Connector P4, 7-8 (XRDY). Jumper K1 2-3 and P21 2-3. K1 is under U17. While this is a very simple program it shows that your FPGA is able to control the S100 bus (via XRDY). This is important because you are using the U10 3.3V level shifter to activate the 5V XRDY line. Here is a picture of the board at this stage. Next we will use our FPGA board to do something useful. Again starting off very simple. 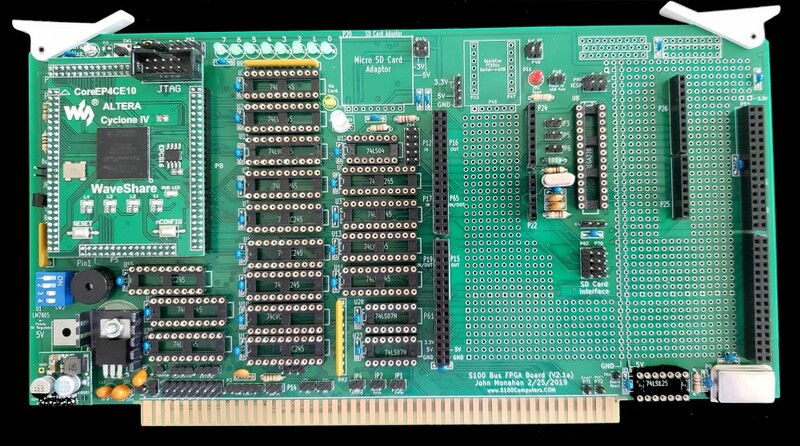 We will program the FPGA board to display on it 8 LEDs (D1-D8) the 8 bit value sent to the S100 bus I/O port 68H. (Assuming port 68H is unused in your system. Use your Z80 Master monitor "R" command to check). 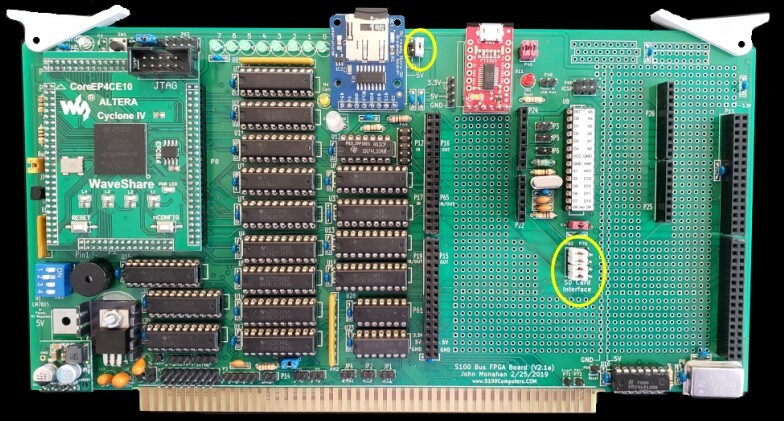 Remove the above FPGA Shields Connector Jumper P4, 7-8 (XRDY). Add U12 and be sure to have jumper P21 2-3 (Slave Mode). Add U7, U6, U5, U4, U14, U20 and U17. Place the card in the bus, the LED K2 should be Red. As mentioned above, always be careful with the 74LVC245 OE* pins. Here is a picture of the board at this stage. First we jumper P21 1-2 so DIRECTION is HIGH (3.3V). The LED K2 should now be Green. This way the 74LVC245 buffers U7, U5, U3,U4, U14 and U20 are outputting to the S100 bus. Critically however, in every case the OE* pin is High. (All FPGA pins are high on power-up). Add U11 and U16. Jumper the LHS FPGA Shields Connector P4 1-2 and P2 4-5. Add jumper JP15 for the buzzer. Jumper P2 4-5 (TMA0*). To run this "program", boot up your Z80 and load up the FPGA code. Then transfer control to TMA0 from your Z80 Monitor ("O" command). You should see the S100 bus Address lines and Data lines continuously change in value. Please see the short video I made of this using the V1 Board. As for the V1 Board, pressing the SW1 switch will hold the address & data lines. The buzzer should also sound. Releasing the SW1 button and the count process should continue. Please study and understand everything in the FPGA_Board_AddressLinesTest.bdf file before proceeding further. It is essential that you understand ever aspect of that file before going further. From now on almost everything is going to be FPGA programming! Here is a picture of the board at this stage. The tricky part is programming this Flash RAM. I found the documentation poor and confusing. A summary of the process for the V1 FPGA board is described here. We do the exact same for this board. The central section of the patch area contains support circuitry to run a ATMEGA 328 CPU. The four shield sockets have the same pinout as the Arduino UNO and that of our Mega 328-2560 Board. If you wish to use this feature please see the Mega 328-2560 Board page write-up. There is sufficient space in the patch area to place a simple circuit. 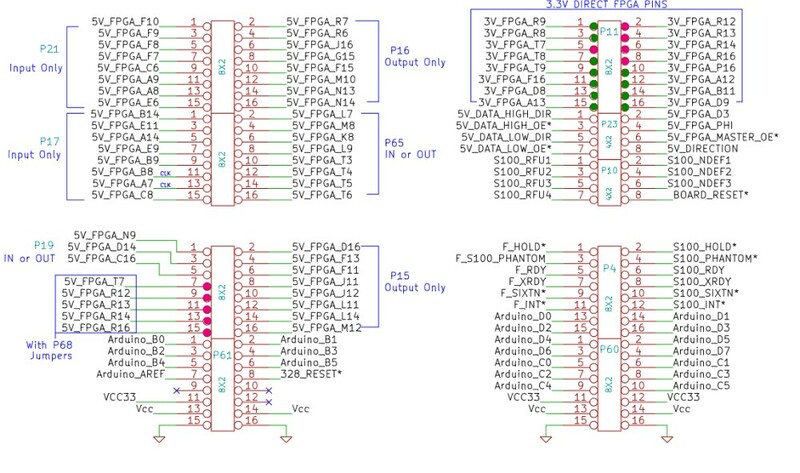 There are a number of spare pins on P61, P4 and P60 to allow a linkage with the FPGA. Of course standard Arduino Shield boards should also work. To test the basic circuit we run the equivalent "Hello World" Arduino test we flash a LED with Blink.INO. Simply insert a the long lead (+) of an LED into pin 6 or P26 (UNO Pin13). Insert the short lead into P26-7 (GND). If you happen to have an Arduino UNO (or equivalent) program it with BLINL.INO. The LED should blink in the UNO board. Remove the 328 CPU from the UNO board and insert it into the FPGA Board U8 socket. Again insert the LED into P26 as you did for the UNO board. Upon power up the LED should blink. If not don't go further until you fix the problem. The simple BLINK.INO code can be downloaded from the bottom of this page. Next we need to add the circuit to program the Arduino UNO circuit. While you can always program the ATMEGA 328 CPU via the ICSP (P80) socket, it requires a special programmer. More commonly one simply programs the CPU via a USB port connection to its Rx,Tx pins. For this we use the same circuit we used in our Mega 328-2560 board. Add the SparkFun FT231x USB->Serial Converter to P45. You only actually need the bottom P45 pins but using the side pins gives the unit more strength. You need to solder the unit directly to the board in order for the FPGA boards to fit overhead. It looks like the Adfruit CP2104 is an equivelent adaptor (at half the price) but i have not checked it out yet. Add jumpers P46 1-2 7 2-3 (vertically). Jumper K4 2-3. If you press your computer reset bottom the D11 LED should flash. Upload the above BLINK.INO code again into the CPU -- this time using a USB cable from your PC and the Arduino Sketch Upload menu item within the Arduino IDE. You can change the blink frequency to reassure your upload has worked. During an upload the surface mount LED on the FT231x unit flash. Finally we will utilize the Arduino CPU to access an SD card. Insert the Adafruit Micro SD Card adaptor. Again I like to solder the unit directly to the board. But you can use a socket if you like for easy removal. We will run this card (for now) from our Arduino CPU. So we will need 5V to the card (jumper P42 3-4). Be real careful you jumper P82 to the nearest pins on P70. See the picture below. It is critical you do NOT connect the FPGA the 3.3V pins (P70 2,4,6,8 to P70 1,3,5,7). Double check and see the picture below. 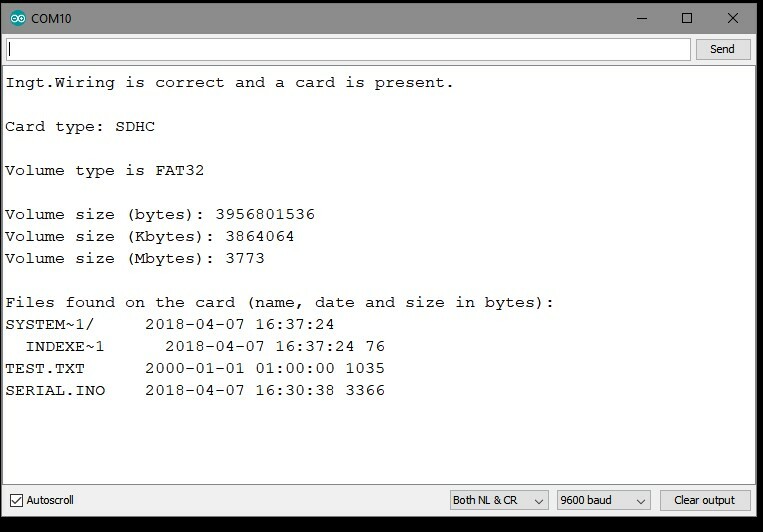 Please see our Mega 328-2560 board for more information as to how to utilize this SD card with the Arduino software and CPU. 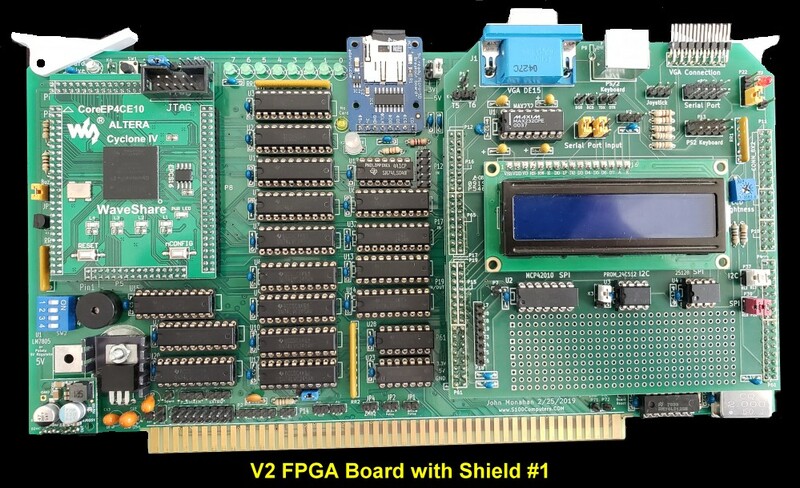 V2 FPGA Board & Code Circuits For FPGA Shields. This section, over time, will contain separate page links on this site to new FPGA code and board circuits using the above V2 board. There are now almost limitless examples of FPGA code in the public domain for most major digital electronic circuits. Two popular sites are OpenCores, Grants MUlTICOMP and fpga4fun. If you develop a useful FPGA application with this board please consider sending it to me, I will place it in this section. UART_PORT_V2 #1 A simple UART port interface to the S100 Bus. A VGA PONG GAME_V2 #1 A simple VGA interface demo. No known bugs at this stage. There appears to be a few variations of the 74LVC245 20 pin DIP level Shifters chips with "A", "AN" etc after the 245. As best I can tell so long as they are 20 pin DIPs they are all OK. I use Mouser chips # 595-SN74LVC245AN. The WaveShare Cyclone IV adaptor can be obtained directly from Waveshare. The WaveShare unit uses unusual 2mm dual row pin connectors. Unlike to normal 0.1" connectors these are quite rare an expensive (Digi-Key #S5750-30-ND). You need to carefully cut them to size, carefully cutting off the extra pins with a wire cutter. The USB serial Adaptor is from Sparkfun F1231x. The Micro SD Card adaptor is from AdaFruit. 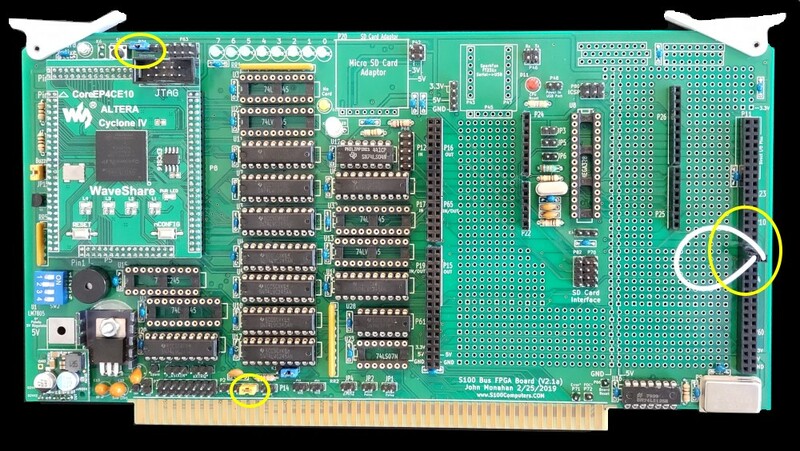 Please note the final verson of this board (V2.1a) differs very slightly in the placement of some of the components shown on this page.